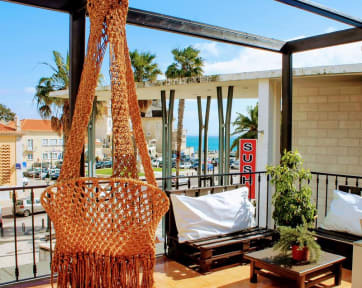 Stunning beaches, restaurants with delicious seafood, bars, nightclubs, malls and museums are all within short walking distance of the hostel, with nearby train and bus stations offering access to Lisbon and Sintra. Our hostel boasts a sunny terrace overlooking the ocean, a fully equipped kitchen, a delicious breakfast to start the day and an inviting bar to start the night. Friendly, local staff will provide you with the best tips for your trip and all the help you could wish for during your holiday.